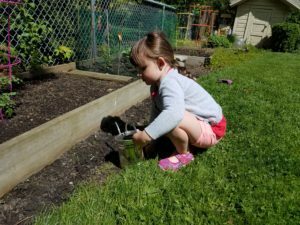 Planting a vegetable garden or a row of summer flowers gives kids even as young as 4 or 5 the chance to dig in the dirt, learn where food comes from and feel comfortable outdoors. To help our kids avoid having Nature Deficit Disorder, a documented problem these days, it's best to start early! We had the rare privilege of visiting recently with daylily expert Ann Redmon from Manhattan Kansas. Ms. Redmon has cross-bred many daylilies to create new varieties, and has registered four of them. Pictured here is one of her registered lilies, called "Hannah Banana." Daylilies are great in any garden. But remember, you want cultivated varieties, not the common and very tall orange "ditch lilies" that spread by rhizomes and crowd out cultivated plants. Daylilies are easy to care for and add bright spots of midsummer color in shades of yellow, orange, red, white, pink, even green like this one, and combinations of these colors. 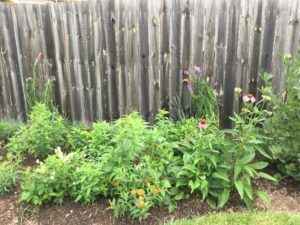 Native plants play a special role for pollinators in providing habitat for their own life cycle. We are all most familiar with the necessity of having milkweed available to support the life cycle of the Monarch butterfly. Monarchs cannot survive without milkweed to support the caterpillar that eventually becomes a Monarch butterfly. Other insects, including the all-important pollinating bees, also require specific native plants for their life cycle. We can help them by including some native plants in our gardens. Here’s a list to get you started: milkweed, including butterfly weed, swamp milkweed, and common milkweed; thistle (as pictured); coneflower, particularly the native purple coneflower; monarda, coreopsis, foxglove penstemon; black-eyed Susan, and several grasses including little bluestem, panicum, prairie dropseed, and June grass. Calycanthus is a native shrub with an unusual waxy flower that has a fruity scent. Wonderfully different. 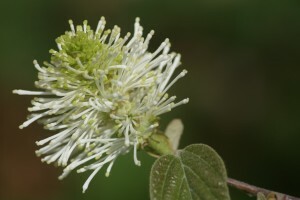 Fothergilla is a spring-blooming shrub with very unusual blossoms (shown here). 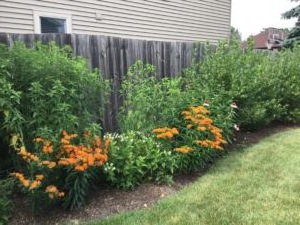 It grows well in both shade and sun, and is sure to get comments and compliments. 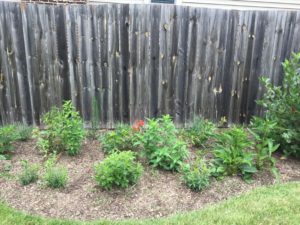 The best way to have a garden that doesn't look like every other one on the block is to incorporate a wide variety of less-common shrubbery. Here's one to consider. 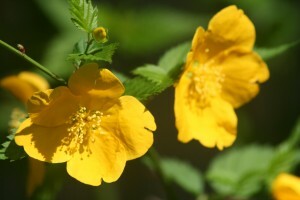 Kerria is blooming now with its stunning yellow golden blossoms. And would you believe it -- this is a shade loving shrub!